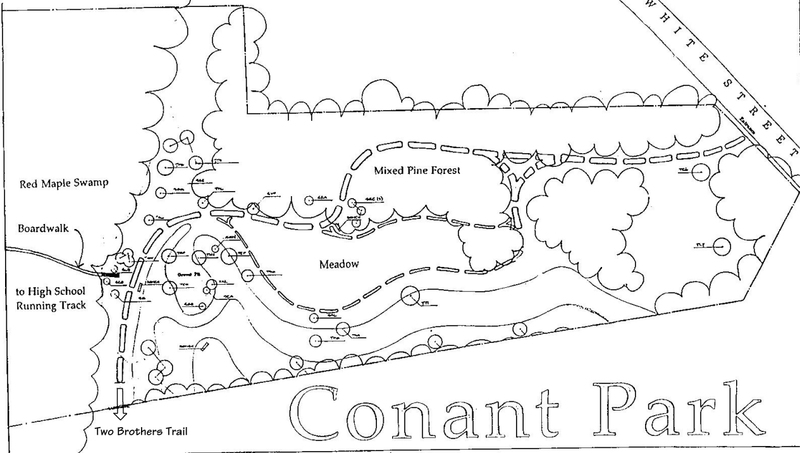 This park consists of two distinctly different wildlife and vegetation habitats. The section near White Street is primarily a mature red and white pine grove and the section near the school playing fields is a swamp. Steep wooded slopes occur on one side of the pine grove. The Trust has planted additional trees and shrubs including larch, azaleas, sweetgum, yellow wood, silverbell, red bud, and a tulip tree. The elevated level of road noise from nearby I-495 may disturb the tranquility of the area. Off White Street. In the center of a busy and somewhat congested area of town. It is bounded by Littleton Lumber Company, Pine Tree Park, residences and the Middle School playing fields. Well-developed, includes a boardwalk through the swamp. An old sand pit on the property once produced beach-quality sand. 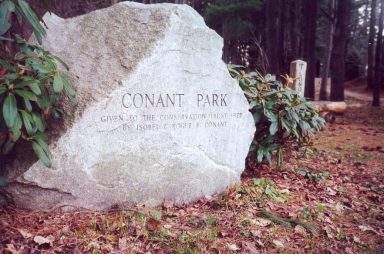 This land was donated to the Littleton Conservation Trust in 1977 by Roger and Isabel Conant.